Just 20 years of age, just two professional fights, just 21 amateur fights, just four days notice. 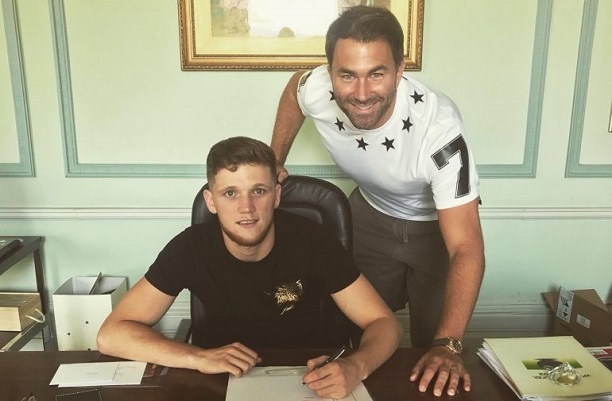 Plenty have questioned why Jordan Latimer [2(0)-0] has chosen to take on a debuting top amateur on extreme short notice but there was no decision to be made for the Sligo-Manchester middleweight. Latimer takes on Commonwealth bronze medallist John Docherty on Saturday night at the Metro Radio Arena in Newcastle, live on Sky Sports, and it’s an early chance to fulfil a dream. “The reason I took this fight is first I have never refused a fight on any notice,” Latimer told Irish-Boxing.com. ‘Pretty Boy’ Latimer acknowledges that the match-up has raised eye-brows, especially as he has a mooted fight with Limerick’s Graham McCormack in the pipeline for December. Indeed, Latimer admits that he didn’t know Scottish puncher Docherty was the opponent when he accepted a spot on this weekend’s bill. “When it was offered to fight on Ritson undercard, I didn’t know it was him,” the southpaw revealed. “I accepted instantly, I didn’t have to think about it,” he added before giving his new analysis. There’s a personal significance to this Saturday’s opportunity, especially with World Mental Health Day having been this week. Latimer lost his father to suicide back when he was only an infant and the fighter is keen to pay tribute and raise awareness on live TV.